How’s this for fun: while waiting for an already-ordered sandwich, you see a neighborhood local walk by, point to the establishment behind you, and announce to his associates, “Food’s not great. Really good beer, but food’s not great.” Perhaps the name “Good” is less a boast and more an admission? In any case, soon enough my sandwich arrived and I was able to judge for myself. The BLT is a simple enough sandwich, and tends to go wrong in one of two areas: too much mayonnaise or bland tomatoes. Neither problem came up here, although with the tomatoes being green and fried I couldn’t help but think they could have been much more than they were. The cornmeal breading wasn’t tremendously flavorful, which is really a shame. 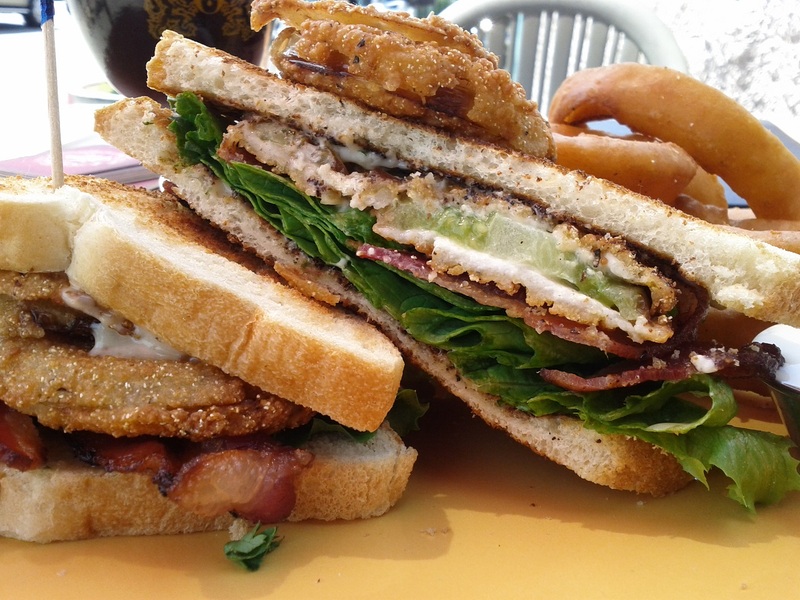 The BLT is such a simple sandwich you need to take advantage of every opportunity to get a really great one, and if you’re going to include some fried green tomatoes, it would be best if you didn’t simply coast on their being fried. The sandwich wasn’t bad, just not great. Let that be a lesson to me about not consulting passers by prior to my order. This entry was posted in Sandwich Reviews and tagged BLT, Los Angeles, Reviews by Pete, Sandwiches I Have Eaten, Sandwiches Made For Me, Silver Lake by Pete. Bookmark the permalink.